The wind was blowing, it was cold, really cold. Winter had finally set in and elk hunting with 16 year old Korie was off to a blistering cold but exciting start. Korie is not only a tough hunter that is more than glad to brave single digit temperatures in pursuit of her hunting dreams, she is an outstanding young lady that is a true ambassador to youth hunters across the country. 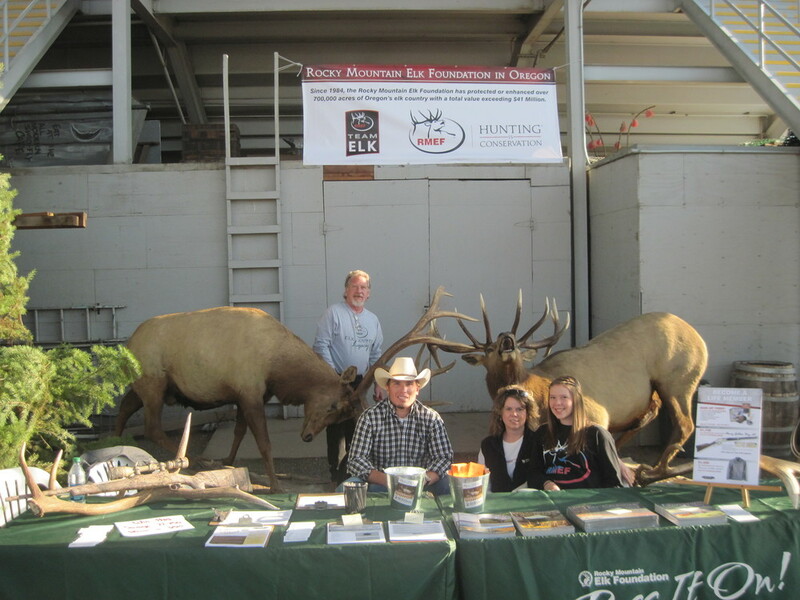 Korie, a junior in high school, is on the honor Scott Reinhardt (Oregon State Co-Chair), Chad Klinkenborg (RMEF Regional Director – Northern Oregon), Marla Campbell, and Korie Campbell (Pendleton chapter volunteers) working the booth at the 2012 PBR Event in Pendleton, Oregon.roll, a member of the National Honor Society and an active RMEF Youth Member that volunteers her free time doing fundraising and habitat enhancement projects on behalf of the Pendleton Oregon chapter of RMEF. This is one amazing girl that is not afraid to get out there and get dirty removing sections of downed fence in a critical area where over 500 head of elk calve and migrate through each year. Korie understands how hunting is conservation and even arranged for Northern Oregon Regional Director, Chad Klinkenborg, into coming to Pendleton to her Careers class this Fall to give a speech about his job and the RMEF. The amount of time and service that Korie provides her community and state go on and on. 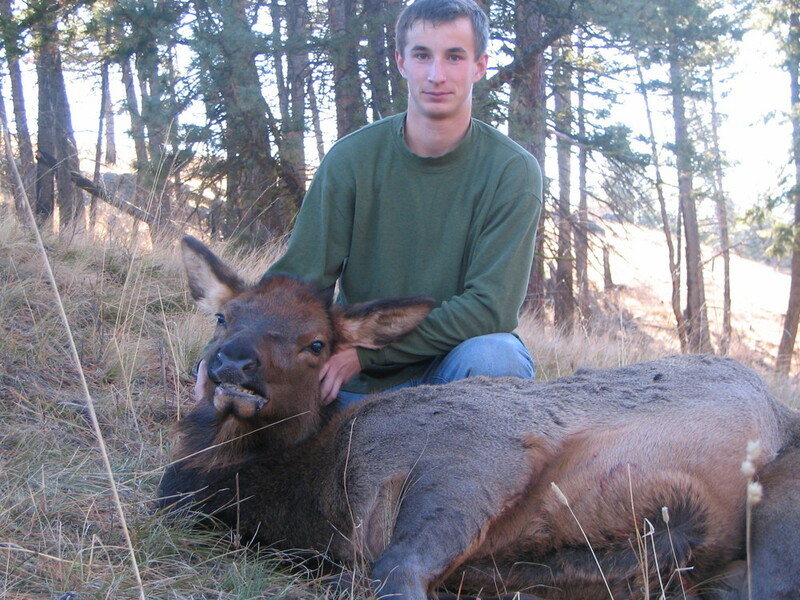 Most recently, she and her father (RMEF Pendleton OR Chapter Chair) Tim took one of her friends, Donovan Pointer, who had drawn an elk tag out hunting when his own father was suddenly unable to take him. The trio had quite the hunt hiking for over 15 miles in freezing cold temperatures where Donovan was able to harvest his first elk. Both Korie and Donovan were able to experience the fact that the real work begins after the trigger is pulled and had a very long trek back to civilization packing out the elk. 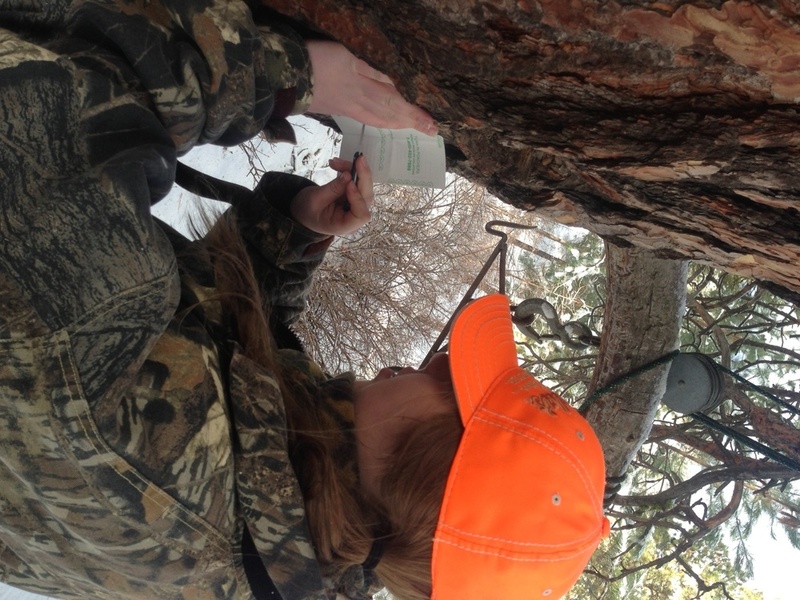 Korie is truly helping to ensure the continuation of the next generation of elk and elk hunters. It was an honor to share the field with Korie and her father Tim in her pursuit of elk for RMEF's Team Elk television show. Below you can read first hand Korie's account of our hunt together. I am truly looking forward to sharing it with all of you in 2014. People often ask me why I hunt; they ask why I enjoy spending my time out in the middle of nowhere, and why I love it so much. I just look at them, smile and say, “I hunt because that’s who I am.” Hunting is more than just a sport; hunting is a passion I have always shared with my dad. When I heard earlier this year that I was going to have this unique opportunity to be able to go on a filmed hunt with Kristy Titus and Team Elk, I was ecstatic. I had looked forward to this hunt for months, and it finally came, and it was the experience of a lifetime. After meeting landowners Chris and Donna Heffernan, Kristy Titus and Nolan Betterman (the cameraman) the previous evening to discuss our plan, we were met by Sheldon Heffernan in front of our sleeping quarters in the wee hours of the morning. During the evening, it had snowed a couple inches in town and the higher in elevation we climbed the deeper the snow got and the more intense it was coming down. We took a short drive to their property to get down to business. I remember shaking with excitement as I got myself ready to endure the day to come. The closer we got, the harder my body shook with excitement. We met Chris, laid out our game plan, and plotted to catch the elk on the move, but the snow storm created a bit of a challenge. While trying to position ourselves and stay hidden, we fought the changing wind and knew that the elk were not going to be moving much, as it was difficult to see and hear. We crept in the tree line and moments later, we heard an elk bugle; nothing gets your heart pumping faster than the sweet sound of a bugle while in the woods. It was a sign that there were elk here, and all we had to do was find them. Korie and her father Tim. After being stationary for a few minutes, we decided it would be better for us to move with the wind and to slowly ease our way down through the trees and go from there. We walked nice and slow and had our eyes and ears open. I was in the lead of our hunting party and the level of excitement was at a maximum when I saw movement out of the corner of my eye. My heart started pounding as I stopped to take another look, and there were elk right in front of us. I turned around and looked at Kristy and whispered, “There are four elk right there.” The adrenaline was pumping through my veins as I looked through my scope, and it had me shaking. I lined up my crosshairs with a cow’s kill zone and when I heard Kristy give me the okay, I took a deep breath and pulled the trigger. After my shot, she ran right at us and stopped under a tree. I got myself ready for another shot, but she turned and headed downhill and we lost sight of her. After agreeing that I hit her, we decided to move down to where she was standing to look for blood, and more elk scattered. We searched the area and found nothing. We extended the search to a broader range, and finally spotted her. There she was, lying dead in the snow. The smile on everybody’s faces, the excitement around me, the hugs and the congratulatory Me, Kruger, Sheldon & Chris Heffernan, Korie & Tim Campbell at the skinning tree.comments provided a sense of accomplishment and made me realize that this experience was something I would never forget. The fact that I got to share this extraordinary experience with my dad and that I was able to meet some amazing people along the way was incredible. I am extremely grateful to have had this opportunity to hunt with Kristy, Nolan, the Heffernan family, and to have spent this time with my dad. It was definitely the hunt of a lifetime and I cannot wait to watch it on Team Elk in 2014.